The Berbers of the Anti-Atlas and of the Sirwa, Morroco are a sedentary people whose survival depends on agriculture and the herding of small flocks of goats and sheep. This situation is further threatened by scarce and irregular rainfall. Verification of property deeds.. Agadir of Amantazert, area of Igherm, western Anti-Atlas. Photo: Geert Aerts, 1998. In times of war, as the different villages and clans were forging alliances against each other, the food stores of the adversaries were a much coveted bounty. In order to defend themselves and protect their food reserves, the inhabitants of several hamlets and villages would combine their resources and build fortified communal granaries. Each family would have food storage and a shelter in the event of an attack. From this concept comes the word Agadir, which means both fortress and collective storage. There they would store a variety of foodstuffs : grains, mainly barley, would keep for up to 25 years, almonds up to 20 years, argan nuts for 30 years, ghee and honey preserved in sealed glazed terracotta urns and oils in long necked jars for several years. Various items were also stored there: salt cakes, dates, figs, grasshoppers, hennae and sheepskins. Weapons and ammunition for defense, jewelry and holiday garments, property deeds written on wood tablets and documents found their way there. On the Jmaa, a council composed of the male representatives of each family, rested the decision to build an Agadir. The collective purchased the land and was responsible for building the fences, ramparts, look-out towers and commons areas. Each family supervised the construction of its quarters and was assessed a fee based on the number of rooms they required. A gatekeeper was appointed to guard the Agadir. Beside being required to be there days and nights, he was the only keyholder and thus held responsible for any thefts on the premises. Beside providing lodging and storage, the Agadir’s tenants paid him in cash and goods, based on the value of their stored reserves. At times, many a family had to assume the gatekeeper’s duty. 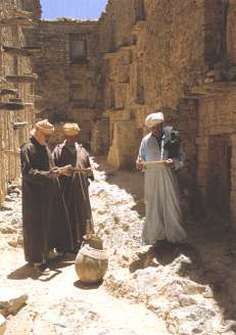 Outside of the Agadir, but within the fence, were located various buildings such as the forge. The smith, a travelling worker, resided there during his stays while working on new orders or making needed repairs. Water reserves were a survival necessity to sustain long sieges. So rainwaters, while rare, were collected and channeled to holding tanks. The founding charter listed the property title deed, the by laws listed the rights and responsibilities of the tenants, as well as the common chores such as maintenance, guard duties, policing and punishment of crimes commited within the Agadir. Rules of common law governed the social interactions of the Agadir’s tenants. The oldest of these documents (XVII century) is the Charter of Ajarif’s Agadir, located on the Idouska Oufella’s tribal land. It was used as a base document when new Agadir were needed. There are two types of granaries based on the lifestyle of their users. When the users are sedentary and survive solely from agriculture the only requirement is for rooms in which to store their reserves. However, if they live from both agriculture and herding - small flocks of sheep and goats - they require storage for their reserves and a secure enclosed area within the fence in which to keep their flocks. 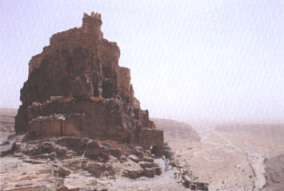 The various lifestyles and survival ways of the Shleuhs of the Anti-Atlas and of the Siroua determine the requirements the granaries must meet. Agadir of Amtoudi, Id Aïssa, Presahara. Photo: Geert Aerts, 1998. Agadir of Tizgui, Sirwa. Photo: Geert Aerts, 1998. For several generations now, the Agadir have been out of commision and most are in ruins. This situation arises from the lack of rain in the last few decades, bad harvests, population shifts and emigration to regions or cities which can provide better living conditions and regular incomes. As a result this century old practice of storing foodstuffs is vanishing. The Agadir still in use are located in areas where the harvests are adequate and regular.